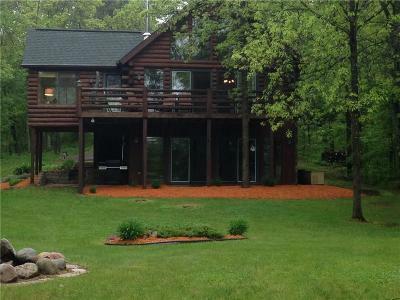 This is the quintessential Northwoods Lake property! This amazing log-sided 4 bedroom, 3 bathroom cabin is the perfect vacation location, seasonally or year round! From the open concept Great Room/Dining/Kitchen floor plan, with the wall of windows overlooking the lake (and a cozy wood stove in the corner), to the lower level Family Room, with it's large screen TV, gas fireplace, and game table, no detail has been missed! Includes a new septic system and generator! The 2 garages provide room for your lake toys, as well as a workroom with a half bath, and an unfinished storage area/bunk room! This property also has an excellent history as a Vacation Rental property; when not enjoying the cabin yourself, earn good income!! Directions: From Trego, On Hwy 53, Take County Highway E West About A Mile To Pair O' Lakes Rd. (Street Sign Is Faded, Look For Woodland Sign); Take A Right And Go About Another Mile. Look For Woodland Sign And Mile Marker W6070 On The Right.